Ron filled the hood's scoop opening with sheet plastic then primed the entire body with Tamiya Gray Primer. The front clip is covered with the same Tamiya Light Blue Ron used on the interior. 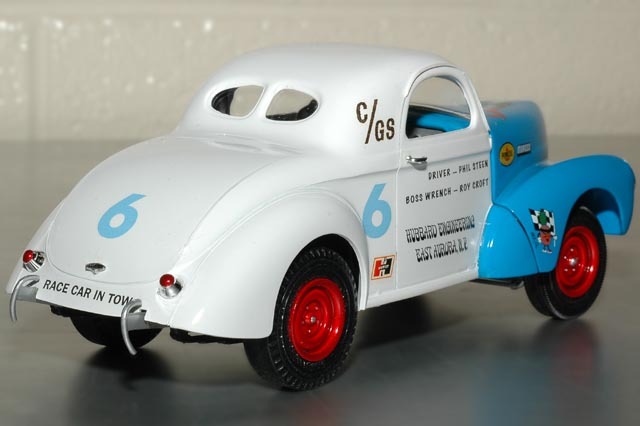 The rest of the body is covered in highly-contrasting Tamiya Pure White. The decals are a combination of pieces from the Stevens International re-issue of the AMT 1937 Chevrolet and decals Ron found, you guessed it -- in his parts box.